Note the reviews are mixed on this chair, but regardless it is a great price. Cheapest it has ever been. Usually sells around £60. 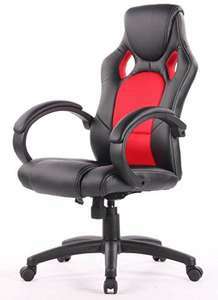 Could be a bargain for anyone looking for a gaming/computer/(maybe home office) chair? Bargain, usually sells anywhere between £60 - £80 , 50% of reviews are 5*. What do you want for £28 ? At least the reviews are real not like most of the 3rd party on Amazon. If it's for a child it's got to be worth a punt. Reading reviews earlier model would bleed red dye onto your clothes, there's no clarification if that's fixed. Good price, but reviews are off putting..
Buy it, if it's rubbish send it back. Don't stand for it. I bought two of these for my children from an ebay seller for around £50 each - they are of reasonable quality and quite sturdy. The only point I'll make is that on both of my chairs the left armrest was ripped due to insufficient packaging - the bolts on the feet dug into the armrest during transit. I had to get replacements for both armrests which took several weeks. Racing bucket seat chairs have been around for years and have only just became mainstream in stores like Currys etc. They are not just for children (Google 'DX Racer', had my one (A different model) that i paid £250 for back in 2008. Another note is this chair is sold in 'The Range' for about £60, its comfy but the back support isnt great (I know as i sat on one). These things look ridiculous and I would never buy one, but that is a great price for a reasonably ok chair. I have this chair and paid a little more for it a while back on prime day. for £27.99 you wont get better. Strong enough for adults? Well it's for one of my boys, but he's a big lad! Is this for kids only? If you are an adult and going to use it regularly avoid, I bought a similar one same company and style but supposedly better quality. Within weeks the chair mechanism started to tilt back over and due to the style you can not bend it back into shape and as a result could not use it without a large cushion to keep you upright! Fair dues to the company I complained, they offered me a discount, I declined and they gave me a full refund. Can't argue with the price though just don't expect to get too much out of it. Should fit (most) adults fine. Does anyone know of a back support chair for about 10 hours seating a day, that doesn't cost a fortune or is that impossible? Racing bucket seat chairs have been around for years and have only just …Racing bucket seat chairs have been around for years and have only just became mainstream in stores like Currys etc. They are not just for children (Google 'DX Racer', had my one (A different model) that i paid £250 for back in 2008. Another note is this chair is sold in 'The Range' for about £60, its comfy but the back support isnt great (I know as i sat on one). I realise that. I have a fairly expensive Noblechair myself. But I wouldn't imagine this particular chair would last too long supporting the weight of the average adult. Using this chair for 2 years already, still in excellent condition. Bargain. Dammit I needed this last week! A friend has this chair and it is an awful squeaky chair. It’s better to buy an IKEA office chair for £30-50. I have one and have been using it for more than an year and it’s like new. IKEA quality never disappoints. Watch out a friend had this chair and the red dye stained his clothes and the manufacturing quality is awful. Avoid if I were you. Shows 15 in stock but wont add to basket!! I just bought a chair yesterday from Argos which was going straight back if I could have ordered this. Good price, although I bought a Secret Lab Titan and it's by far the best chair I have ever owned. For the time spent at a desk either working or in leisure time, it pays to get something decent. Would it be practical for use with a gaming wheel and pedals or would you keep rolling backwards when trying to race? out of stock... great for all those that got this! Anyone who has ordered one of these - I ordered a black one 3 years ago for way more than double this price. I am sitting on it right now and it has no wear, still looks brand new. I work from home so it gets about 10 hours of me sitting on it Mon-Fri and a few hours on the weekend. Comfortable seat, the black dye for me didn't run but can't comment on the red dye. Bargain price. Only one issue - it starts to creak A LOT when you sit back on it after a while. Oil doesn't help.